Pizza-within-a-pizza was previously a menu item that existed only in hypotheticals. "Inception was okay," people said as they exited theaters two years ago, "but what I'd really like to see is a pizza-within-a-pizza. Yumyumyum." "What's my favorite topping?" they asked themselves as they filled out their online dating profiles. "Pizza! Pizza on top of pizza!" "Don't you see, you fools?" exasperated grad students yelled at their colleagues, banging their fists into chalkboards. "Pizza-within-a-pizza can never occur! The pizza would become too unstable!" But now pizza-within-a-pizza has occurred. And it is beautiful. 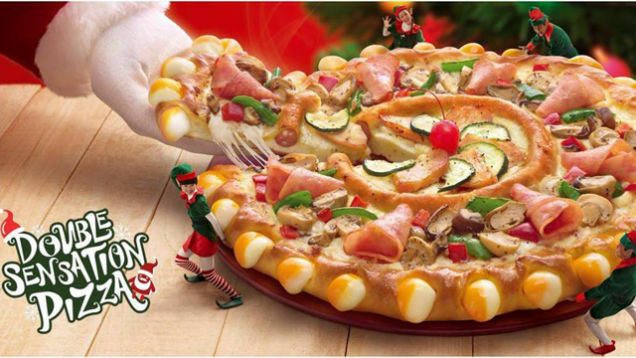 Pizza-within-a-pizza was achieved by the ragtag bunch of dreamers at Pizza Hut Singapore, who see not see pizzas as they are and ask, "Why?" but instead imagine levels of pizza that never were and ask, "Why not?" As observed by Brand Eating, the so-called "Double Sensation Pizza" is structured around two rings of crust. The outer ring, stuffed with mozzarella, Parmesan, and cheddar cheeses (that ooze out of holes poked intermittently), frames the Ur-pizza. This is the pie on which all subsequent pies will be constructed. This pizza is topped with turkey ham bell peppers, and mushrooms, on top of salsa (?). Working our way from the outer ring to the inner, we encounter Enlightenment in the form of a second pizza. This crust is stuffed with chicken sausage and yet more cheese. It is topped with smoked chicken and zucchini on "pepper alfredo" sauce. The meta-pizza is garnished with a single red cherry, representing the blood of all those who have come before and failed. Unfortunately, the pizza will only be offered through the end of December. Following that, the algorithm will be erased; the technology for pizza-within-a-pizza destroyed before man can use it to harm himself.